Smelly feet? Besides being socially unacceptable, it turns out that you’re at greater risk of malaria. Mosquitoes, it turns out, love smelly feet. The new study looked at what attracts mosquitoes to human beings. While we knew that the CO2 you breathe out is what initially brings mosquitoes buzzing toward you. But once they get close to their target, they are quickly overcome by the smell of feet, which sends them divebombing to your lower extremities to bite you and–if you live in the developing world–give you malaria. 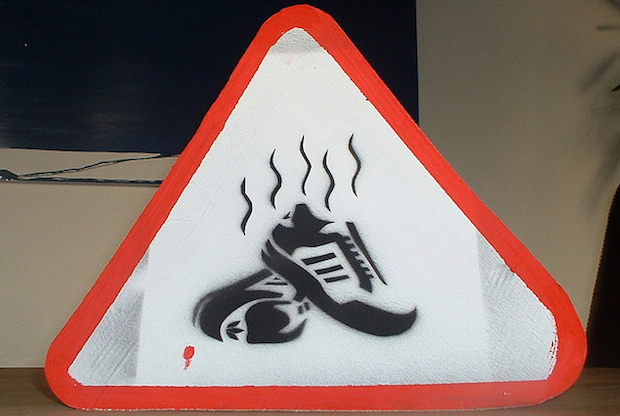 There are–and this is real science–10 different bacteria-caused odors that make up foot smell. Mosquitoes can smell nine of them. And, more importantly, these smells have the effect of totally blocking the bugs CO2 receptors. The only thing they like more than your breath is your feet. Besides being a pretty good case study in personal hygiene, this could lead to major breakthroughs in diverting and trapping mosquitoes before they bite. Besides the rather low-tech solution of mosquito nets, there are CO2 traps that are intended to ensnare the mosquitoes with wisps of CO2 before killing them. They are, however, mostly ineffective. What might be more effective are the new foot-smell traps soon to be developed based on the results of this study. Breathe all the carbon dioxide out you want, those mosquitoes can’t smell it. They’ll be busy trying to find the feet. Your house might not smell great, but you’ll be mosquito free.